All sources are hyperlinked and in bold. Internal complexity [‘complicatedness’] is growing at 6.7% per year. Internal complexity is growing six times faster than external complexity. Managers can spend up to 28% of time writing and reading email. Up to 50% of time spent on email and in meetings is ‘unnecessary’. 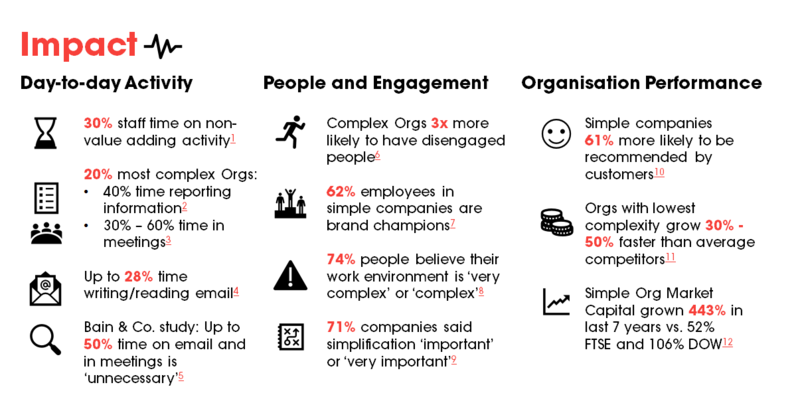 Complex organisations are three times more likely to have disengaged people. 62% of employees in simple companies are brand champions. 74% of people believe their work environment is ‘very complex’ or ‘complex’. 71% of companies said simplification is ‘important’ or ‘very important’. Simple companies are 61% more likely to be recommended by customers. Organisations with the lowest complexity grow 30% – 50% faster than their average competitors. The stock prices of simple organisations have grown 443% in the last 7 years vs. 52% for the FTSE and 106% for the DOW. 64% of customers are willing to pay more for a simpler experience. Takeaway: From every way you look at it, being simple pays more than being complex. Gut feeling is backed up by unequivocal data. The complexity problem is getting worse for organisations. And those who arrest that trend by seeking to simplify will be more successful than those gripped by inertia or obliviousness. What’s complexity costing your organisation? Take our Complexity survey here.